The Parramatta River Urban Design Strategy (the Strategy) is a strategy for the regeneration of Sydney’s second largest CBD and its waterfront—a site that encompasses 31 hectares in the centre of Parramatta. The Strategy reorientates the Parramatta’s CBD towards the river and positions Parramatta Quay as a new water arrival point in the heart of Parramatta, connecting Parramatta’s CBD to Circular Quay by ferry. 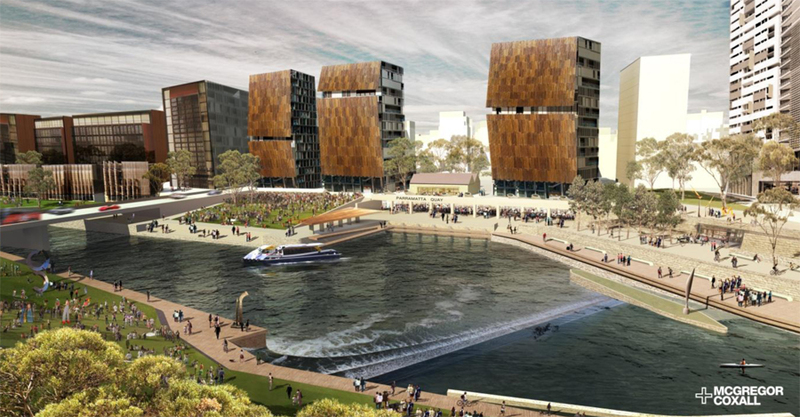 It also proposes four new vibrant mixed-use precincts on the river foreshore. In addition, the Strategy incorporates a new brand for the City of Parramatta: ‘Where The Waters Meet’, based on the meeting point of the harbour and river. Parramatta is close to the geographic centre of metropolitan Sydney. It is currently undergoing change economically, demographically and physically. Parramatta City Centre is unique because it is the only major CBD within Sydney that is located on a riverfront. The name Parramatta means ‘head of the waters’ where fresh water meets salt water. Despite Parramatta’s riverfront location, the CBD has traditionally been oriented away from the river. At present there is a once-in-a-generation opportunity for Parramatta to make the most of its central and unique river location. The Parramatta River Urban Design Strategy maximises this opportunity by reconnecting the city centre with its greatest asset, the river. The Strategy re-acknowledges the start of the Parramatta City Centre from the river, highlights the connection between the western most extent of Sydney Harbour and Parramatta City, and refocuses Parramatta’s CBD towards the river. To enhance the aquatic ecology of the river and improve the connection of Parramatta Quay to the CBD, the Strategy proposes to move the point at which salt and fresh water meet, by relocating the Charles Street Weir and moving Parramatta Quay to a more central location. The Strategy proposes a mixture of land uses along the river foreshore, offering spaces for events, recreation, commerce, employment art and culture. New laneways named ‘Water Streets’ will improve the connections between Parramatta City and the river and will feature public art, water sculptures and water sensitive urban design initiatives. New medium rise apartment buildings with northerly aspects are also proposed and will contribute to the mix of housing types and tenures in the area. They will be set behind lower buildings on the water’s edge, defining the edge of the city and the visual corridor of the river. The Strategy redefines and consolidates Parramatta’s urban centre and improves its connection to its river and Parramatta Quay. The new city core is to be defined by Parramatta Station to the south, the proposed North Parramatta Station to the north, and Church Street and Smith Streets to the west and east. The relocation of Charles Street Weir and Parramatta Quay help to redefine the city centre and reorient it towards the river. 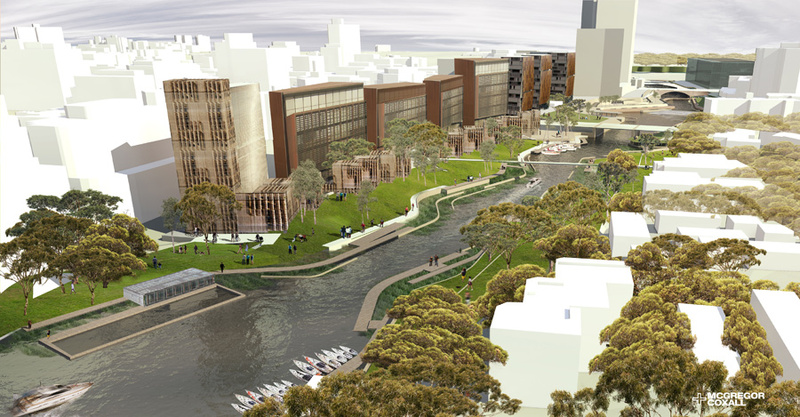 The Parramatta River will become a focus for activity and will be better connected to the CBD through a series of laneways. One of the proposed laneways, Civic Place, will link the CBD to Parramatta Quay by a short five-minute walk. A new pedestrian walkway under Lennox Bridge will link the proposed new urban terraces to the Foreshore Parklands and Parramatta Quay to the east and the King’s School and Parramatta Parklands to the west. Another new pedestrian crossing over the Marsden Street Weir will connect the visual arts building and the perform­ing arts building on the opposite banks of the river. An enhanced city centre arrival experience from the Rivercat ferry. A series of north-south laneways that will connect the CBD to the riverfront. Restaurants and small retail shops near the water’s edge, which will be designed to withstand flood events at 3.0 metre reduced levels. A broad mix of land uses along the river frontage that will offer spaces for events, recreation, commerce, employment, art and culture. Medium density apartments with northerly aspects, which will contribute to the mix of housing types and tenures in the area. The Strategy has considered long-term effects of climate change and projected sea level rise levels as well as flooding issues that affect Parramatta’s city area. It proposes innovative ways to address these key constraints. The new developments along the waterfront will be designed to withstand flood events at 3.0 metre reduced levels. Also environmentally, the removal of the Charles Street Weir and the introduction of a new weir in a reconstructed river channel will help to repair the aquatic ecology of the river. Restoring a more natural form to the Brickfield Creek channel outlet including vegetated banks. Stormwater treatment systems on either side of the river to treat local catchments. A new pedestrian walkway under Lennox Bridge will also include a small stormwater treatment system. Harvested stormwater and wastewater will be reused to provide water for non-potable purposes in the new developments. The structure of the proposed new weir is to have a fish-friendly design. The new mixed use development in the West Harbour mixed-use precinct is also to be designed to achieve a six Green Star rating. The Strategy aims to redesign Parramatta to be more pedestrian friendly and a more comfortable and exciting place to visit. It links Parramatta’s CBD to the riverfront and redevelops Parramatta’s river foreshore into an interesting and inviting place to visit. 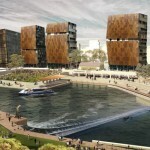 The Strategy makes Parramatta Quay a focus for activity in Parramatta. The public space around the Quay are to include a city square at Philip Street, a grass slope down to the river adjacent to the Smith Street Bridge and a promenade that steps down to the water’s edge. The new riverfront development will create a vibrant environment for people to work and play in, and which is appealing to visit at any time of the day or night. Parramatta Quay is to become the heart of the Parramatta’s night­ time economy with restaurants, bars and a grand terrace that can be used as a moonlight cinema or for performances. Patrons of the restaurants on the waterside terraces will be able to watch the express Rivercat ferry come and go against the backdrop of the new weir and a new sculptural fish ladder. The proposal includes remodeling the Riverside Theatre as well, which is to have a grand glass atrium that links to a terrace bar. The Strategy will also enable commuter ferries and pleasure craft to moor in the heart of Parramatta, enhancing the experience of arrival by ferry into Parramatta and bringing activity and excitement to the water’s edge in a new Parramatta Quay. The increased use of the Parramatta foreshore will enhance its safety, day and night. The presence of more people in the Parramatta CBD and river foreshore area will likely reduce crime. Passive surveillance from people in buildings, cafes and shops adjacent to the foreshore area and public spaces will also improve safety in the area. The Strategy redefines and consolidates Parramatta’s urban centre and provides better links between the CBD to the river and Parramatta Quay, making the entire area more walkable. The laneways linking the CBD to the river will provide enjoyable, functional and diverse routes to walk along. This will encourage more people to walk and cycle to and within Parramatta’s City Centre and along the foreshore. The relocation of the Parramatta Quay closer to Parramatta’s CBD will also encourage more people to catch the ferry and walk into the CBD. 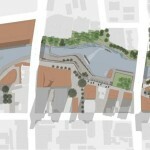 The Riverbank Urban Design Strategy. Existing site data, including the Place Leaders Charette. The River Foreshore Plan 2009-16. An experience audit and baseline perception results. The Strategy creates the basis for developing a delivery framework that is uniquely suited to Parramatta, its community and context. It will inform future development along Parramatta’s foreshore and CBD, as well as potential future amendments to the Parramatta City Centre Local Environmental Plan and Development Control Plan. The Strategy successfully provides a framework for re-orientating Parramatta’s CBD to the river, regenerating the river foreshore and creating new vibrant mixed-use precincts along the riverfront. 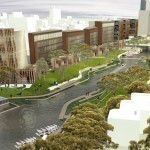 To accompany the redevelopment, a new vision for the brand of Parramatta has been developed: ‘Where The Waters Meet’. The Strategy will form the basis of a detailed masterplan and a business case, which are the next steps for its delivery. The Strategy creates momentum to enact positive change in Parramatta and helps to set an agenda for this change. It provides the foundation for informed discussion about the future direc­tion and positioning of Parramatta’s CBD and waterfront. It creates the basis for developing a delivery framework that is uniquely suited to Parramatta, its community and its context. Parramatta City Council recognises the role of the Strategy and the aims underpinning it in contributing to the ongoing economic, cultural and environmentally sustainable regeneration of Parramatta’s CBD and foreshore.